Choose your blanket size, we can make you a small baby size 75x100 cm or a kids size 100x150 cm or a adult size 200x150 cm. All sizes are measured approximate. Choose your blanket colour. 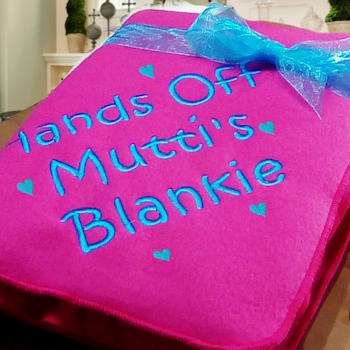 We will beautifully embroider a name or brief message to one corner of the fleece with little hearts scattered around. You choose the thread colour and font style.